I saw a social media post the other day that showed Jesus telling a lady that He didn’t want to be a chore to be checked off the list, instead He wanted to be her coworker all day. 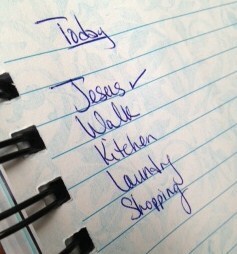 After reading it, I had to think a minute, because you see, I LOVE lists! I had to think, do I do that? My alarm that goes off in the morning is entitled “Jesus Time”. I must admit, I do find some satisfaction in knowing when I have read and prayed I have done the right and good Christian thing. Is my time with Him about Him? Or is it about me checking Him off the list? I have to tell you, I feel more convicted as I write this confession than I did the day I considered that post. There are so many days I wonder…how can He love me? My heart is sometimes dark, selfish, prideful…but He does. He loves me. He loves you too. Click here to find out how. I’m so thankful that God knows my heart. He knows I want to honor and glorify Him. He knows how much I need Him, and love Him and want to spend time learning and living His Word. He knows. The term “quiet time” is a little dusty, and sometimes my time with God, is anything BUT quiet, however, nurturing my relationship with God is NOT a chore. It is a privilege. I hope and pray today you consider it as well. Quiet time is our daily appointment with God when we shut out the noise of the world, whether physical noise or the clutter in our minds and prepare ourselves to listen to God. During our quiet time, we may sing praise songs, pray, read scripture, a daily devotion, meditate on God’s word, or just be quiet and listen. Of course we pray and praise Him at all times, but this is a special appointed time. Why is it so difficult to do? If we stop to think about it for a moment, we recognize that we live in enemy-occupied territory, so constructing an ideal spiritual surrounding is nearly impossible. Satan, our chief opponent, does not want us to spend quiet times with God. In fact, it is his goal to prevent that in any way possible. He knows that the more time we spend with God, the more likely we are to have God’s heart, strength and power to acomplish God’s goals on this earth. Satan does not want us to succeed. I Peter 5:8, “Be alert and of sober mind. God wants all people to be saved, but Satan wants us all to perish. Praise God because His plan is greater! Satan is no match for God, but he can trouble God’s children, and he does. The next time you are finding it difficult to get away from the noise and get alone with God, remember who is standing in your way. Then remember who is greater! Quiet time can be so difficult to prioritize. It’s tempting to make excuses or just not bother. Preparing our hearts to hear from God requires a focused effort. Noise, whether outside or inside, distracts us. If we fail to understand the importance of having a regular, committed quiet time with God, we are not likely to hear His voice…the one that whispers, “This is the way; walk in it” (Isaiah 30:21). God longs to spend time with us. Consider what He was willing to do for us, in order to reunite us with Him. Keep kleenex and a notebook handy.